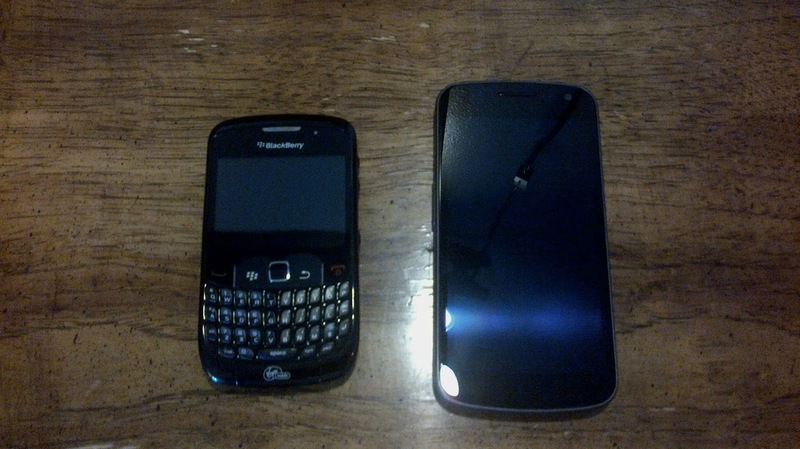 If you want a prime example of how fickle I am when it comes to technology, here it is: I have downgraded from a beautiful, big, shiny Android phone (Samsung Galaxy Nexus) to my old, slow, not-so-shiny BlackBerry (Curve 8530). I wouldn't hold it against you if you think I've gone mental. But here's where I'm coming from. A few posts ago I was citing the fact that I had the Galaxy Nexus to justify getting a BlackBerry PlayBook in spite of its slim selection of apps. Whatever apps I couldn't get on the PlayBook, I'd make up for with my fancy Android phone. But something happened in the couple weeks I've had my PlayBook. I've enjoyed using it so much, even without a vast library of apps, that I reevaluated how I used the Galaxy Nexus. I came to the conclusion that, of the 150+ apps I had installed on the thing, I was using only a handful on a regular basis. With the exception of the Netflix app, I was using the phone primarily for communication and productivity, not content consumption. Android and iOS devices seem to be designed, first and foremost, for content consumption (Google Play and iTunes). There's nothing wrong with this, especially if that's what you're looking for in a mobile device. However, the actual communication aspects of those devices - the way you use and interact with your email, social networks, text messages, contacts, etc. - seem to be an afterthought. Integration with Google apps and services on my Galaxy Nexus was great, but I'm not fully invested in the Google ecosystem and don't use all of its services. In fact, I'd say I use Microsoft services (SkyDrive, Outlook.com) more than Google's on a daily basis. Google Now was a novelty to me. When I remembered I even had it, it was fun to see what cards were there, but most of the time I'd just clear any notifications and ignore it. It was interesting, but not particularly useful to me. If you're heavily invested in the Google ecosystem and take advantage of everything it has to offer, it makes sense to have an Android device. For people like me who are pretty eclectic when it comes to the technology we use, we probably don't need or enjoy the Android experience as much as others. Another point that factored into my decision to part ways with Android is that, in addition to being content consumption devices, Android phones are designed to be information collection devices. Specifically, information about you. Your browsing habits, location, voice, the apps you use, map searches, shopping, search history - basically any and every way you interact with your Android phone is recorded by Google with the primary purpose feeding you targeted advertising - Google's bread and butter, and still their biggest moneymaker. Fundamentally, what Google really sells is you. It sells you to those who want to advertise their products and services to you. For some, this is a welcome thing. Who wouldn't want a company to know everything it possibly can about you so that it can directly advertise products and services that might actually benefit you? Well...actually...some of us don't. I'm not saying that Google is gathering this information for nefarious purposes...but the point is the information is there, and there would be some pretty nasty consequences if it ever got into the wrong hands. I felt this way when I got my Galaxy Nexus, but I was able to conveniently ignore my nagging conscience by distracting myself with an awesome device that can do some pretty great things. Well, my conscience is still nagging, and after nearly a year of using Android, I think there are other, better options out there for me. The iPhone is not one of them. A great phone, to be sure, but the novelty has worn off for me. Toggling back and forth between home screens and apps is tedious and inefficient for the way I want to work. There's no true multitasking, and switching back and forth between apps is not very fluid, depending on the apps you're using and their demands on the OS. Notifications are an absolute joke compared to Android or even my ancient BlackBerry Curve. The app library is still second to none, but apps aren't everything to me. I look at the overall experience, and I find the iPhone lacking in many ways for the things I want to do. I also think it's overpriced for what you get compared to other options out there today. I'm still looking at Windows Phone, particularly the Nokia Lumia, which is widely regarded the flagship Windows Phone out there today. I'm particularly interested in the integration with the Microsoft services I prefer to use over Google's, but the OS design and functionality is intriguing to me. The metro UI looks great and intuitive, and I'm eager to try out some floor models, soon. My first choice (for now) is BlackBerry. They've got a new OS and new devices and, after being stagnant for a few years, they have made some drastic changes and really seem to be trying to move in the right direction. 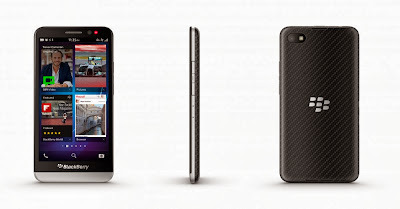 BlackBerry has prided itself on creating devices that are built around communication first. Even my old Curve is a joy to use when it comes to emails, texts, & social media. No toggling in and out of apps and home screens or flipping through app switchers. 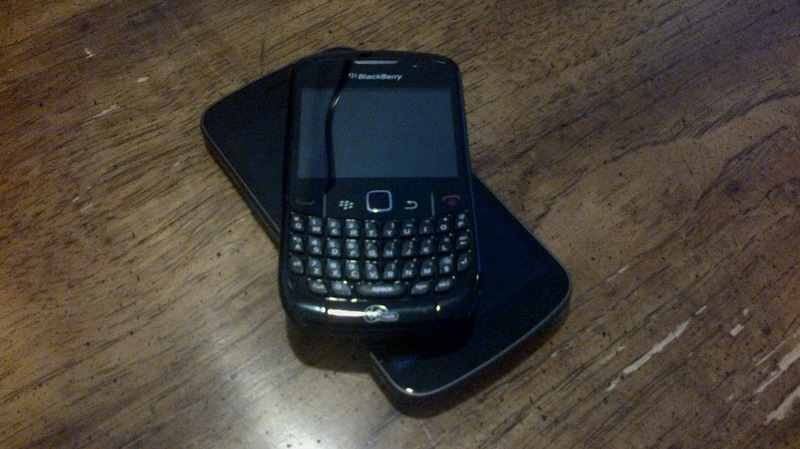 The new BB10 OS supports true, fluid multitasking. Run multiple apps at the same time and seamlessly go back and forth between them without having to freeze them or lose functionality. The "Hub" feature in BB10 that allows you quick access to all your communications without having to navigate home screens, notification windows, or toggle between apps. Bridge is another feature that allows you to link a BB phone with the PlayBook via Bluetooth and manage your contacts and communications on your phone from the tablet. You can also use your phone to remotely control your PlayBook, and even browse the web on your tablet via your phone's data connection. I am able to enjoy all of these Bridge features even on an older BlackBerry phone. And for the love of Pete, why is there not a "phone calls only" feature built into iOS or Android?! 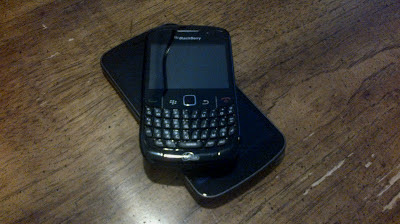 Why must I use a third party app to do what my ancient BlackBerry running BB OS 5 can do out of the box? I suppose I'm also to the point now where I want to root for the underdogs. iPhones and Android phones are so pervasive, these days. I'd like to try to support some outside players trying to make a dent in their market shares by bringing new and different smartphone experiences to the table. I guess I've never really been one to follow the crowd. It's not you, Android, it's me. I'm fickle, and I'm too demanding when it comes to what I want from my technology. You're a great platform in your own right, but I just don't make full use of you and I think you're better suited to different tastes. I'll have fond memories. Like the first time I tried using Google Wallet to make a purchase at vending machine. Or those great panoramic photos I took with you. Maybe BlackBerry will be better for me. Or maybe I just got bored. Either way, it's time to move on.